The best time to visit Phonsavan is during the dry season from November to March, but due to the higher altitude (1100m), the hot season from March to May isn’t nearly as uncomfortable as in lower-lying areas. The wet season runs from May to October and the rains can make traveling to some of the jar sites and other rural destinations difficult, if not impossible. A local bus from Vientiane will cost 120,000 Kip and a VIP bus is 150,000; both take 10-12 hours. Buses from Luang Prabang will cost around 100,000 Kip and take 8 hours, while minibuses will make the trip in 6 and cost a bit more. A minibus from Vang Vieng will cost 110,000 Kip and take 7-8 hours. Coming from Xam Neua, you will pay around 100,000 and spend 8 hours on the bus. A tuk tuk around town should never cost more than 10,000 Kip. Bikes can be rented for 20,000 Kip per day and motorbikes for 100,000. You might be able to bargain those down a bit. Phonsavan has a lot of accommodation options and you will have no trouble just showing up and finding a room. Most places are located on the main street or just off it. Nice Guest House is very popular with backpackers, and your best bet if you’re looking to save, with rooms under $10. It was booked solid when we were there, so we ended up staying elsewhere, but it looked pretty good considering the price. If you don’t mind spending a bit more, $25 will get you a much nicer room at the Hillside Residence Hotel. If you want to have a beer, your best bet are probably the restaurants. There is a discotheque at the Chittavanh Hotel and a few karaoke places around town, but if you’ve been to a disco or a karaoke place in Southeast Asia before, there’s little need to do it again; unless, of course, you’re one of the few who enjoys torture. A local specialty you could try is Mastake Whiskey which is made from a highly valued mushroom called Hed Wai that grows in the surrounding pine forests. Phonsavan has quite a few dining options. As always, Lao food will be the cheapest, especially at small, local restaurants. Like most towns in Laos, Phonsavan also has at least one good, low-priced Indian restaurant. Phonsavan is one of the most heavily bombed locations in history and the surrounding area is still littered with unexploded ordinance. Be very cautious when wandering around any rural areas—stay on the paths if at all possible and pay attention to these markers by the Mine Advisory Group (MAG), which mark the boundaries of a cleared area. The white side indicates the safe side. Check any motorbike you rent very carefully to ensure it is in working order. Apparently there has been an increase in motorbike accidents due to faulty brakes or other equipment. Also, take pictures of the motorbike’s condition in front of the person you are renting from, to avoid any false damage claims later on. If you do cause damage to a motorbike and the quoted repair cost from the rental place seems high, that’s because it is. You can save a lot of money by finding a mechanic on your own. Waterfalls: the Tad Ka Waterfall in Nong Het, the Tad Ka Waterfall in Tajok and the Tad Lang Waterfall are all well worth seeing. You’ll need your own transportation (motorbike, van or jeep) to get there; if you only have time for one, go with the Tad Ka waterfall in Nong Het. My name is Sak and I am from Bangkok, Thailand. 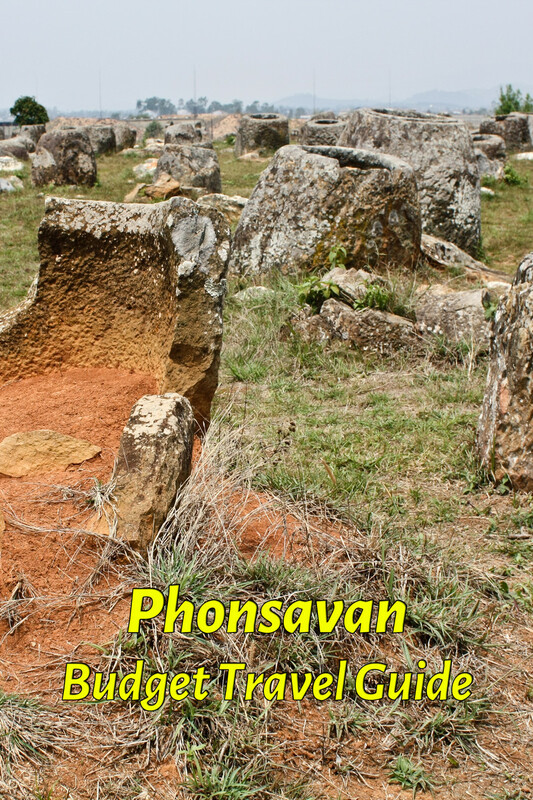 I just finished reading your guide writing about Phonsavan, Laos and I cannot thank you enough for your concise but useful information that I may considerably follow when I take the trip to Phonsavan for this coming November. I shall travel on my own and I do plan to rent the bycicle and ride on it to go to places as you recommended. Thank again for sharing the information and knowlege with the public. I’m glad I could help and I hope you have a great time in Laos. Renting your own transportation is definitely the way to go in Phonsavan. The roads are generally pretty good and traffic is light. Hi, I have 4 days to spare in Bangkok, wondering if I can fly to LP arriving afternoon day 1, spend the nite, go early morning to phonsavan 2nd day, tour plane of jars on motorbike 3rd day and get back to LP by around 12-1pm next day to fly out. Realistic? Or could I tour plane of jars and leave Phonsavan same day latter go back to LP by minvan? Any advice? I would generally advise against rushed trips like this, but it is doable. There is plenty to see in and around Bangkok that wouldn’t have you spending so much time in buses and planes.